An interesting project management solution that offers a good amount of customizability for project and task organization. What if spreadsheets were just as flexible as they are now, but simple to use and easily reconfigured to display data differently? When we look at Monday.com, we get the feeling that this was the team’s inspiration. At first glance, Monday.com looks like pretty standard project management software. 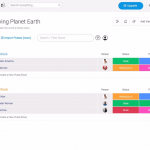 There’s a list view, a timeline for viewing tasks, chart views, assignees, and so on. Dig a little deeper, however, and you’ll see that Monday.com is all about customization. It features drag-and-drop design, editable columns, and rows that can be used for pretty much anything. Instead of just rows and rows of tasks, Monday.com relies on what it calls ‘pulses’, which can be used for tasks, projects, or even clients. It’s an interesting take on project management software that allows for a lot of customization – but it’s not perfect. Monday.com lacks sub-tasks and task dependencies, for example, requiring workarounds for what are pretty fundamental features for its competitors. Nevertheless, for businesses that need a high degree of customization, Monday.com might be the way to go. Founded in 2012 as “dapulse,” Monday.com isn’t quite a newcomer to project management, but the company is still filling out its product. 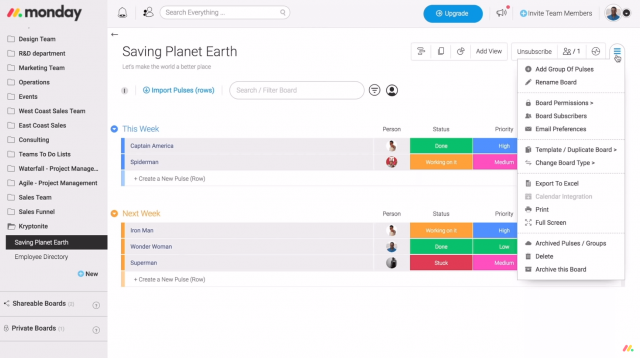 The company only added checklists to its ‘pulses’ a few years ago, for example, and it’s still working on integrations with popular services such as Salesforce and the time tracking tool, Harvest, which Asana has had for a while. Nevertheless, one thing it does have that is very mature is its high degree of customization. The idea with Monday.com is that you can organize it to suit your needs. For example, you can rename ‘pulse’ columns, drag them around into the order you like, and even add more – including some items you don’t usually find, such as the ability to do sums. You can even export all that data to an Excel spreadsheet if you need to. It’s an interesting approach to project management software that allows for a great degree of flexibility in hierarchy, especially compared to other project management options. But it is still a work in progress that lacks some common features you’ll find elsewhere. The company is not big on the idea of subtasks, for example, and offers a workaround for dependencies using its automation feature. Monday.com does its best to eschew built-in hierarchies, allowing users to create their own, but some kind of predetermined data organization is inevitable. Like other project management tools, it starts with the Team at the very top. Below that are what Monday.com calls boards. This is akin to different company departments, or different clients for service-based businesses. Within each board are ‘pulses,’ which (as we explain below) can be used for single tasks or entire projects. Pulses can also be grouped together to create lists. Monday.com offers a dashboard view, allowing users to get a global view of their various boards with bar charts, timelines, and so on. Other key features include helpful global and board-specific search tools, and the ability to share boards with people outside of the company (such as freelancers). Here’s a look at three key features of Monday.com. Pulses are blank slates that can accept all kinds of information. You could, for example, use one pulse for an entire project, and then use the integrated checklists feature as your task list, or attach a simple text file with all your tasks. That approach wouldn’t be ideal for huge projects, but might be ideal for simpler ones. Each pulse also features an activity log, comments, a section to create an FAQ, and the ability to attach files. Monday.com also lets you customize pulse columns, making them act more like templates. The “People” column, for example, can be renamed to “Assignee” or “Lead” depending on what’s appropriate for the situation. Better still, i your tasks needed to have both assignees and leads, you could add two people columns to your pulses. The bottom line is that you can mold pulses into a container of information that suits your needs. Monday.com can also carry out particular actions when something happens through a feature called automations. Like customizations, automations are similar to IFTTT, and allow you to create an automated task in plain language. For example, you can set up an automation that will notify your manager when a pulse’s status changes from “in progress” to “done.” This automation is what Monday.com suggests you can use in lieu of dependencies, but it had its problems in our tests. In the version of Monday.com we used, you couldn’t set automations for specific pulses, such as “when Task 1 is done, alert person in charge of Task 2” – although this help page suggests you can. Instead, we could only set automations to work with entire boards. Our way around this was to add a new status column, rename it “dependency”, and then edit it to have only two statuses: “not ready” and “ready.” We then created an automation to notify another team member when the dependency column changed from “not ready” to “ready.” That way, only tasks using the dependency column would activate this automation. The downside to this approach is that it limits you to notifying only one person per board, as opposed to regular dependencies, where you can notify different team members on a task-by-task basis. Monday.com doesn’t offer traditional third-party integrations the way other services do. Usually, you hook up services like Gmail or Slack, and then start using them with all supported features available. Instead, Monday.com’s integrations are another extension of the company’s “customize everything” ethos. Each supported integration includes various features that you can activate a la carte, using plain language scenarios similar to the website IFTTT (if this, then that). The Gmail integration, for example, allows you to create a new pulse when an email is received from a particular contact. Alternatively, you could use a Slack feature that notifies people in a particular channel (chat room) when a new pulse is created. If all you need from Slack and Gmail are these two features, then that’s all you have to add. Monday.com has a massive amount of pricing options. There are four pricing tiers: Basic, Standard, Pro, and Enterprise. As with other project management software, the features you get increase as you go up in tier. 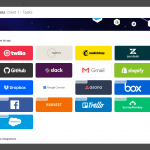 The highlights of the Basic option are unlimited boards, 20 different column types, mobile app access, five automations, one dashboard, kanban view, embedded forms, and 5GB of storage. Move up to Standard, and storage increases to 50GB. You can also share boards with people outside your team, use the timeline view, and increase the number of integrations, automations, and dashboards. Pro adds the formula column, time tracking, chart view, and increases the number of integrations, automations, dashboards, and guests. Finally, the Enterprise tier adds a higher API rate limit, higher level support, audit logs, and includes further increases to integration, automation, and dashboard limits. Within each tier, you can select from nine different pre-set numbers of team members, including 2, 5, 10, 15, 25, 50, 100, 200, and 200+. That’s 36 different pricing options across all the tiers and team sizes – all of which are billed annually. You can find the complete pricing list on Monday.com’s website, but to give you an idea of cost, the 10 team member option is $49 per month for Basic, $79 per month for Standard, $119 per month for Pro, and $238 for Enterprise. The 50-user pricing increases those costs to $250, $399, $599, and $1,198, respectively. 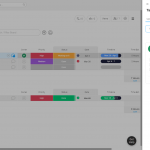 Monday.com should be a top consideration for anyone who wants a highly flexible project management tool with a lot of do-it-yourself customizability. However, it lacks some more common project management features, and (at time of writing) does not have the wide number of custom third-party integrations that other services do. Overall, pricing is pretty good. While you can find some bargains in the lower pricing tier, we suspect most users will need at least the Standard tier, if not Pro – putting Monday.com’s pricing closer to its more well-known rivals. The bendable screen craze continues, as Lenovo has released its design for foldable smartphone. With multiple screens and asymmetrical hinges, to say the design is unique would be a terrible, terrible understatement. More than 100 Microsoft employees have called for an end to the technology company's contract to build HoloLens AR tech for the US military. Microsoft currently holds a $479 million contract to help the army "increase lethality" with AR. Here's what it all means.